We have the plague « You know… that Blog? It appears that the plague – more likely the flu – has decided on a return engagement to our household. I’m not overjoyed, friends. Wee One came home on Thursday with a fever and feeling very lethargic. Children’s Tylenol and early to bed, and she seemed to be ok the next morning. Off to school she went. She came home the same way yesterday – fever, lethargy, coughing, and no appetite – and I knew we were in for it. Sure enough, by last night she had a raging fever and was throwing up. She’s feverish still today, and coughing, but fortunately not throwing up. Kids are so resilient! I’m popping OoO and hoping for the best in my case, because, as we all know… I never do anything half-way. If I get it, it’s going to be bad. On top of this, I woke up yesterday with a pretty severe pain in my kidneys. Not severe enough to send me to the hospital, but pretty bad! My doctor can’t see me until Monday, so I’m sucking it up and taking it easy this weekend. I suspect kidney stones, because while it hurts like hell, I’m not running a fever, and it comes and goes. When I’m on my back, it’s not to bad – if I’m upright, it’s worse. Right now I’m at my desk, and it’s a dull throbbing, with the odd twinge of “Holy crap! Ouch!” thrown in just to make sure I’m constantly aware of it. The Teen is almost done with her “Victory Lap” of high school (taking extra courses while she can) and just snagged herself 2 jobs! One is going to be full time, and the other part time if they can be flexible with hours. She absolutely loves the full time job (score!) so if the part time turns out to be too much, so be it. She’s happier than I’ve seen her in a long time, which makes ME so very happy. When the Teen isn’t happy, the household suffers as a side effect. Teenagers. Argh. The Hubby is off at my folks’ place, doing some work there, and the Teen is off to work with my car, so Wee One and I are stranded at home, sick and sore. We decided today was the day I’d teach her how to hand knit! 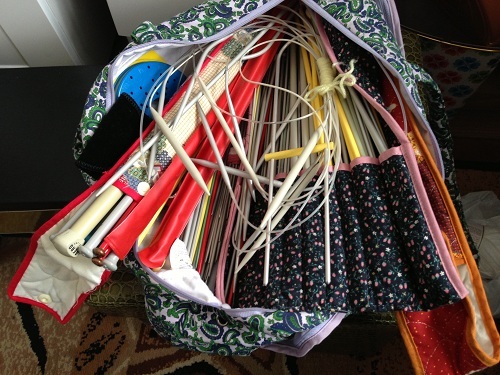 I took my grandmother’s bag of knitting needles from the shelf in my office, and was instantly taken back 40 years to when she was teaching me how to knit as a child. It still smells like her, which made me both misty-eyed and thrilled. She failed to teach my Mom, who doesn’t care for things like knitting or sewing, but I was all about it, which created a real bond between us. 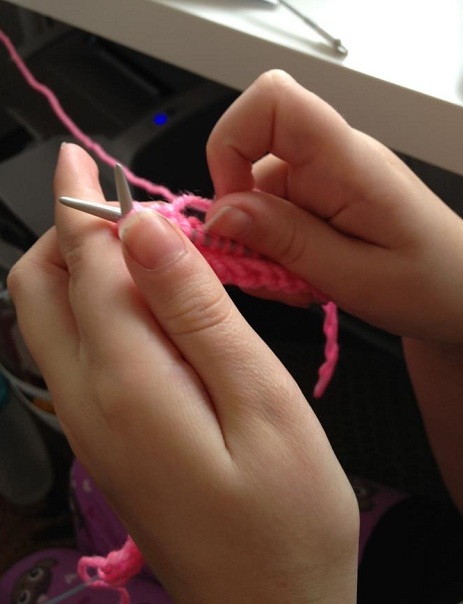 She also taught the Teen to knit as a small child, which is a memory the Teen still holds dear. I’m sad that Wee One knew Mamie (everyone called her Mamie) only as a very frail, very old lady, who was no longer able to hold knitting needles, and unfortunately she won’t have a share in those memories. The very last thing Mamie ever knit was Wee One’s Christmas stocking, though, when I was still pregnant. I think we both knew it would be the last thing, and it was really important to me – to both of us – that she make it, so she kept at it, even though her hands weren’t cooperating, and it was hard for her to concentrate. That amazing old gal persevered though, and it’s something Wee One will always treasure. It’s packed away so I don’t have a picture to show you. Remind me in December, ok? I know Mamie would be so pleased if she knew Wee One was using her knitting needles right now.